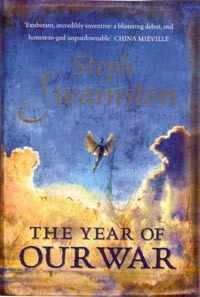 “The Year Of Our War” is the debut fantasy novel by British author Steph Swainston. It is a highly impressive book, even ignoring the fact that this is her first novel. It is highly original, entertainingly plotted and very well written. It is set in “The Fourlands”, a setting which is unusual mix of medieval society with some early-20th Century trappings such as semi-industrialised cities and tabloid newspapers. The population is divided into two categories, the immortal Eszai and the mortal Zescai. The Eszai consist of the fifty members of the “Castle Circle” (and their spouses) who are chosen for immortality because they are the best at a particular task – best archer, best warrior, best blacksmith, best sailor and so on. As long as a more-talented mortal doesn’t come along and successfully challenge them the Eszai can live forever, guiding and protecting the mortals. They are all ruled over by the immortal Emperor, San, who controls the circle and claims to be the oldest man alive. The title of the book might imply that the Fourlands are fighting a year-long war. This is a bit misleading since the empire has been at war for millennia, fighting against an alien race they call “Insects”. The Insects are roughly man-sized, possibly sentient and extremely vicious, attacking everything that moves and covering the land in walls and buildings made of a strange pulpy material the Fourlanders call ‘paper’. Two millennia ago they suddenly appeared on the continent in a small enclosure, they quickly spread over a large part of the continent, turning it into their ‘Paperlands’ before the newly-formed Castle Circle managed to stem the tide. Since then the struggle has been ongoing. The book starts with an attempt by Dunlin Rachiswater, a mortal King of one of the Fourlands, to advance into insect territory and hopefully drive them back. The attempt goes horribly wrong, the King is mortally wounded and the Insects start spreading out into new territory, killing as they go. The Insects are appearing in greater number than ever before, and they threaten to overwhelm the Fourlands. At a time when unity is required, Dunlin’s heir cowers behind his castle walls with his army while the Eszai squabble amongst themselves. The main character of the book is Comet, the Messenger of the Circle and the only immortal able to fly, due to his unusual ancestry. After a harsh upbringing in the gangs of Hacilith, the Fourlands’ largest city, he gained immortality by challenging the previous Messenger. Now he finds himself charged with discovering where the Insects are coming from, while at the same time mediating between feuding immortals. His other problem is an addiction to the drug ‘Cat’ which allows him to ‘shift’ realities into the world of Epsilon, a world he can’t prove exists. Epsilon is a surreal place, seemingly largely populated by puns (inhabitants include Fibre Tooth Tigers, Laardvarks, Impossums, Whorses and Problemmings – lighter than air rodents that throw themselves off cliffs and float into the air), dominated by the vicious Tines and fighting its own war against Insects. The conflict between the immortals is caused by a dispute between Mist, the Circle’s Sailor, and his wife Ata, who hates her husband and believes she should take on the title of ‘Sailor’. Their marital dispute threatens to turn into a martial one after Ata raises an army (and navy) to fight against her husband. Lightning, the Circle’s Archer and Comet’s best friend, allies himself with Ata having long resented Mist being the ruler of land that used to be in Lightning’s family. Comet has to try and reign in Lightning and Ata and get them to fight the Insects instead, while simultaneously providing unwilling assistance in Lightning’s wooing of Swallow Awnydyn. Swallow is a mortal governor of a small town and probably the best musician in the history of the Fourlands. However, after the Emperor decrees that only skills useful to the war qualify someone to become an immortal she embarks on an ill-advised military expedition to try and lift the Insect’s siege of Lowespass fortress, with Lightning and Comet providing unwilling support. As you can probably see, the plot and setting are extremely original – apart from some similarities between the Insects and the Locusts in M.John Harrison’s “A Storm Of Wings” there is nothing else even remotely like this book. It is fascinatingly strange, while still being comprehensible. The land may be very different but the characters are easy to relate to, just trying to go about normal-ish lives in very abnormal circumstances. The main character, Comet, is particularly charismatic despite his serious failings, and his witty commentary on just about everything is one of the novel’s highlights. The writing is superb, sometimes surreal, sometimes ominous, sometimes highly amusing. Each chapter seems to have at least one brilliantly-constructed, highly quotable sentence or phrase – usually provided by Comet. Probably the only criticism that can be made of this book is that the plot does seem a bit aimless at times. A lot of the time the book gets distracted from the war against the Insects, and even the looming civil war between the immortals. While Comet’s reminiscing over past events and his escapades in Epsilon are highly entertaining, they sometimes seem to have little relevance to the main plot. Also, the ending is rushed and the book end far too abruptly. Swainston builds up a fascinating plot, and then ties everything up neatly in a handful of chapters which is slightly unsatisfying. This is an excellent novel, and seems to herald the arrival of a major new talent on the fantasy scene.